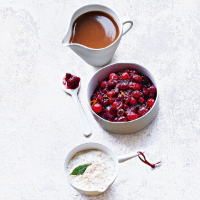 Preparing your bread sauce the night before allows plenty of time for the flavours of onion, cloves and bay to infuse into the milk. Add the bread, fresh nutmeg and cream before serving. 1. Heat the onion, cloves, bay leaves, butter and milk in a small pan. Bring to the boil, reduce the heat and simmer for 20 minutes. This recipe was first published in Thu Nov 09 15:02:00 GMT 2017.